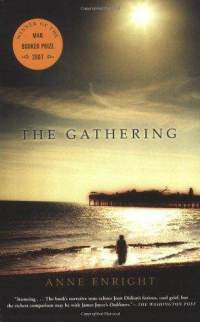 I came to read Anne Enright’s The Gathering in a peculiar way. I didn’t notice it had won the Man Booker Prize, or bother reading the reviews of it, many of which are negative if you want to get right down to it. Instead, I wandered the aisles in the library and picked books that might be good based off their back cover blurbs, and I threw this one into my growing pile of books to check out. I lugged it home, and there I lost it in the mess of my big move. I ended up paying the library $14 for it–the cover price–what a steal, considering libraries generally charge above and beyond any book’s worth. I would too, if I were a librarian–if I had to cover it and key it in and stick the alphabetizing tag on the spine–sure I’d stick it to the irresponsible patrons who take out books at moving time, who do this only because they need books to distract them from their stress. And I had no desire to read this missing book, despite the loss of $14, because I had no context for it. So when it resurfaced, as lost things sometimes do months or years after unpacking, I stuck it in my bookcase and left it there until a few days ago, at which point I remembered I had a hard copy book I hadn’t read (for some reason it takes me ten times as long to read books on my Nook and, besides that, all this is to explain why I’m thinking about a book that came out four years ago. I didn’t even have a Nook four years ago.) What can I say? This book, about a sister grieving her brother’s suicide, was one of those books–the kind that renders me useless and forces me to stare at the ceiling wondering what just happened to me, wondering if I could write a book this stunning. Let me attempt, here, to put my finger on what makes this book special. The language is lyrical. That’s a start. I don’t need a hard-hitting plot if I get caught up in the language. The author also does something funny with memory. You may not like this, but it’s difficult to tell what actually occurs in the protagonist’s life because her childhood memories are skewed, and she invents memories where there are none, or where her memories are confused. I relate to the main character, Veronica, because she’s a disconnected female, and although some people want a solid history to understand how a woman gets to be so withdrawn from the physical world around her, I don’t need tragic childhood events to explain away personality flaws. In fact, it annoys me when authors attempt to explain their characters’ foibles with past events and family histories. This author pulls away from that. The reader (or this reader) never knows exactly why Veronica is screwed up, even though the protagonist, herself, searches for substantive reasons. “I do remember God’s love, that year in Ada’s when I was eight, and Liam was nine. I remember it very clearly. Sister Benedict told us to take Jesus ‘into our hearts’ and I did, no problem. I check my heart now, and I find that there is still a feeling there, of something hot and struggling. I roll my eyes back under my closed lids, and there is the sense of opening in the middle of my forehead. The chest thing is like fighting for words and the forehead thing is pure and empty, like after all the words have been said. The part that fascinates me is this: the biology of faith. Is faith biological? Is it caught up in the coding of what makes a person who she is? And do some people lack it? Do we need nothing more than the right words at the right time, or the wrong words at the wrong time to fill this biological urge? Is this the reason why some people believe in nonsense, because the wrong words filled them at the wrong moment? And is this why other people eschew faith, because it isn’t in their biology? Ultimately, this book left me feeling hopeful. I’ve read my share of literary books, and most of them are filled with hopelessness. The author could have ended this book in so many bad ways, and she chose not to. I can’t give away the ending, obviously, but I wish I could because the image Enright employs is a perfect one for bringing a detached heroine back to herself. I could almost feel it happening to me.